Posda Tuot, cousin of Nak Kim “Rickie” Chhoeun, speaks during a news conference in downtown LA Wednesday morning. Rickie was detained by ICE on October 20, 2017. Photo courtesy of AAAJ-LA. The U.S. government was ordered last week by an Orange County judge to put a temporary hold on the deportations of Cambodian refugees recently detained by immigration officers to allow more time for them to review their cases. Santa Ana-based U.S. District Judge Cormac J. Carney granted on Thursday, December 14 a temporary restraining order that prevents the government from executing “final orders of removal” that would repatriate about 1,900 Cambodian nationals, most of which are based on criminal convictions. Many of these individuals fled the Khmer Rouge regime as children. The judge’s decision came two days after the petitioners—including Long Beach resident Nak Kim Chhoeun and Modesto resident Mony Neth who also represent about 1,900 other similarly-situated individuals—filed an application “for a temporary restraining order seeking a stay of removal until petitioners are given an opportunity to reopen and challenge their orders of removal,” according to court documents. Since October, about 100 individuals have been detained by Immigration and Customs Enforcement (ICE) which intends to detain more, according to court documents. The December 12 application was filed just six days before 50 Cambodian citizens were scheduled to be on a flight back to Cambodia, according to Melanie Kim, a staff attorney in the Immigrant Rights Program for Asian Americans Advancing Justice-Asian Law Caucus (AAAJ-ALC). The Cambodian government was willing to repatriate 78 citizens and had travel documents (documents establishing one’s identity like a passport) for them. 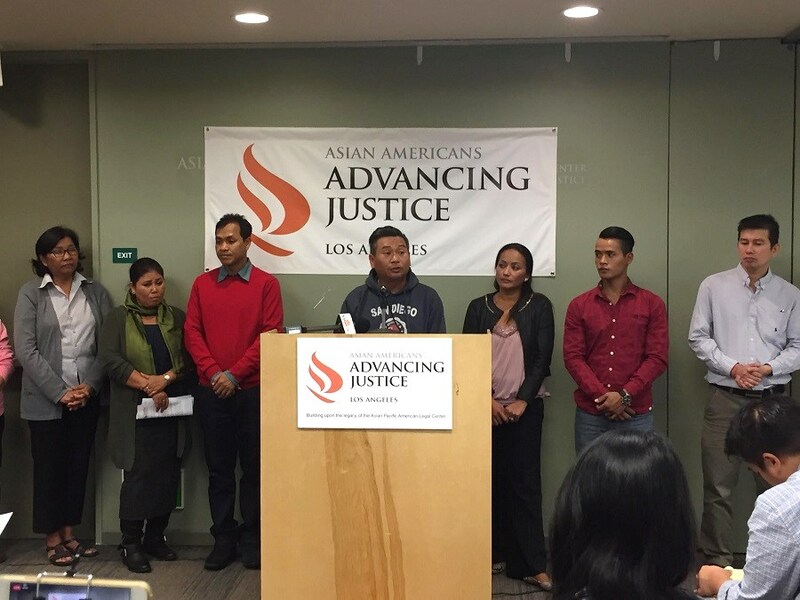 In November, AAAJ-ALC and other civil rights groups filed a lawsuit challenging what they claimed were the “unlawful” detentions of these Cambodian refugees, including 42-year-old Chhoeun who is a plaintiff in the lawsuit. He and Neth were both detained by ICE on October 20. AAAJ-LA officials said these raids are in retaliation to the Cambodian government’s decision last year to suspend a repatriation agreement with the U.S. that was signed in 2002. Even with the signed agreement, Cambodia was only accepting about 34 individuals a year. The requested hold on deportations will be in effect until January 11 when a court hearing is scheduled to take place in the U.S. Courthouse, located at 411 West Fourth Street in Santa Ana. Before that date the respondents named in the case, including Attorney General Jeff Sessions and Acting U.S. Secretary of Homeland Security Elaine Duke, are expected to file an opposition to the court’s order with petitioners expected to file a reply. This gives time for petitioners to file for a release in immigration court or at least be able to reopen and evaluate their cases, Kim said.